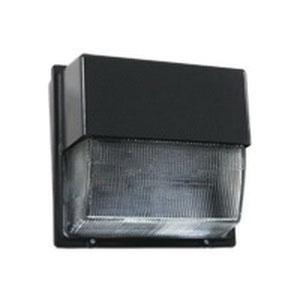 Lithonia Lighting Acuity® Collection Type III medium 30-LED wall luminaire has voltage rating of 120 - 277-Volts and driver current rating of 1000-Milli-Amps. It has current rating of 0.96-Amp at 120-Volts, 0.56-Amp at 208-Volts, 0.48-Amp at 240-Volts and 0.42-Amp at 277-Volts. This 104-Watt LED lamp has color rendering index of 70, color temperature of 4000K and delivers brightness of 8400 Lumens. It features die-cast aluminum housing and fully gasketed tempered glass lens. It supports vertical surface mounting. It measures 16-1/4-Inch x 8-Inch x 15-3/4-Inch. Wall luminaire has energy saving, long life design and provides simple installation. Durable TGIC thermoset powder coat finish offers superior resistance to corrosion and weathering. This wall luminaire is the perfect choice for building mounted doorway and pathway illumination for nearly any facility. It has protective glass lens that safeguards the light engine's precision-molded proprietary acrylic lenses. Thermally isolated LED driver mounts to the front casting for low operating temperature and long life. This wall luminaire is the perfect choice for building mounted doorway and pathway illumination for nearly any facility. Wall luminaire is UL listed and meets DLC requirements.